Growth Habit: Onion grass is a perennial which produces a small brown corm underground. Flowering occurs in Spring each year. One to four flowers are produced per plant. Type of Plant: Autumn-winter germinating perennial. Fruit/Seed: A capsule containing many small oval seeds is produced soon after flowering, and as seeds mature, the capsule angles down to the soil surface. Eventually the capsule dries and splits open, releasing the seeds. Dispersal: Soil disturbance and movement is the main form of dispersal, both of seed and corms. Water may also transport seeds small distances. Distribution: Onion grass is a widespread weed throughout Tasmania. It most commonly occurs in run-down areas or pastures and turf areas such as sports fields, and on roadsides. 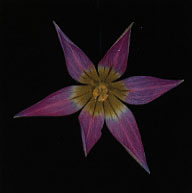 Status: Romulea rosea is not a declared weed under the Noxious Weeds Act 1964. Onion weed is extremely difficult to remove once an infestation has become established. The tough leathery leaf blades readily blunt mower blades, and animals rarely graze the plant. Physical removal is difficult as the corms are usually very deep in the soil (up to 200mm). Pulling on the leaf blades usually snaps them off at the top of the corm, leaving the corm in the soil. Cultivation is seldom useful in destroying plants and may in fact assist their dispersal by breaking up and distributing the corm. Limited success may be obtained where the corms can be brought to the soil surface to dry out in summer. Herbicides registered for use in Tasmania include metsulfuron methyl and glyphosate.